Fresh off his G3 European and UK tour with Joe Satriani and John Petrucci, former SCORPIONS guitarist Uli Jon Roth is widely regarded as one of the greatest guitar players ever. He is one of the last greats who is still around to present his magical style of playing which he already forged in the late Sixties when he was still in his teens. Uli played his first ever show in December 1968 - at the age of 13 - and to celebrate his upcoming 50th Stage Anniversary, he will play 6 very special UK concerts. The two hour-plus programme will consist of carefully selected highlights from Uli’s entire musical career, which - by now - is spanning no less than 5 decades! 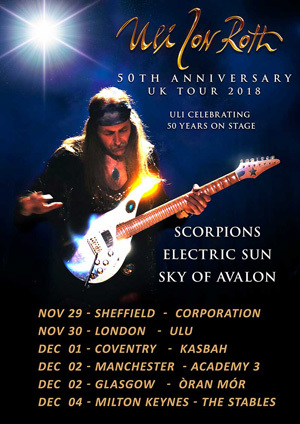 The amazing thing is that Uli Jon Roth keeps on getting better, as we have seen amply demonstrated by his astonishing and powerful recent appearances at the G3 Tour of Europe and the UK with Joe Satriani and John Petrucci. In recent times, Uli has successfully revisited the early music of his celebrated SCOPRIONS days which resulted in the superb Scorpions Revisited double CD and Tokyo Tapes Revisited DVD/Blu-Ray releases. The 50th Anniversary set will naturally include the best of that timeless material, including "The Sails of Charon", "In Trance", "Fly to the Rainbow" and many other songs.